I got home from BEA late Monday night and had the latest Book Riot Quarterly Box waiting for me! I was excited. I didn't expect it to arrive for a few more days. Book Riot is a very popular book blog and recently created a quarterly subscription box. For $50, they will send you a box filled with books and book related items every quarter. This is their third box and the second that I received. 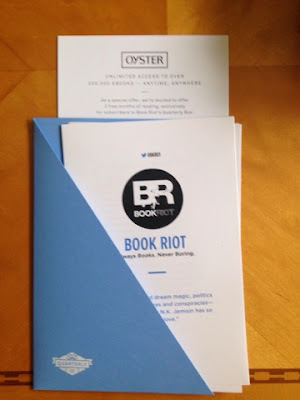 The box includes a 2 month subscription code to Oyster, an e-book subscription service. I already subscribe. I was going to give it to my husband but I remembered they don't have an Android app yet (Apple is better, people!). I'll have to figure out what to do with it. 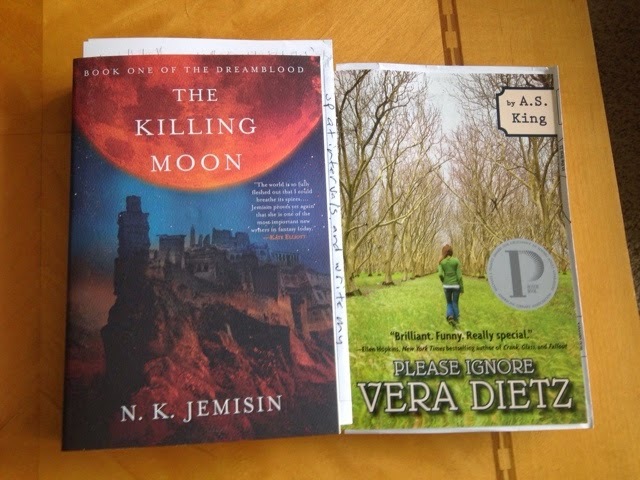 These are two of the books included in the box this month. I've always wanted to read something by N.K. Jemisin so I can't wait to start this. Unfortunately, I've already read Please Ignore Vera Dietz. I did enjoy it though and I don't own a copy. I'll have to decide whether I'm going to keep it or give it away. 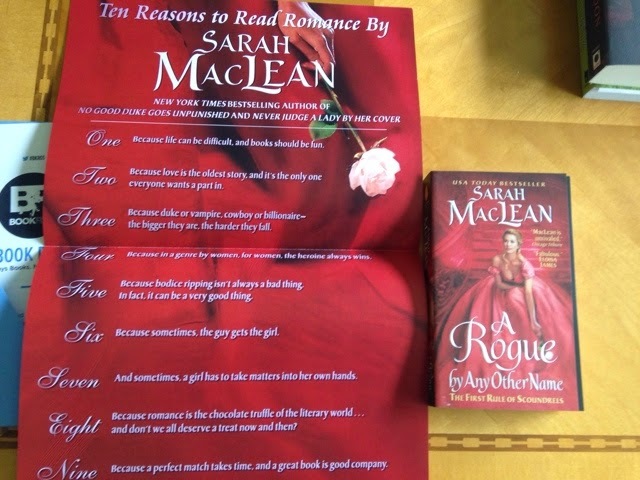 Yay for a Sarah MacLean romance! The Book Riot people really champion her. I've read two of her books and enjoyed them. The book came with a cute poster too. 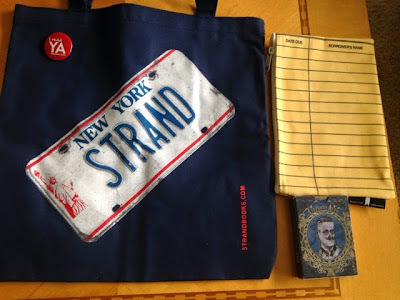 Just what I need after BEA: Another tote bag. However, I've always wanted a Strand tote bag, but couldn't justify it since I got all these tote bags at BEA. So I'm quite happy. The box also included an I Read YA button that I already have as well as some cute literary playing cards. Plus, a library pad themed pencil pag. This matches a tote bag that my friend Danny bought at BEA. I'm not sure what I'll do with it, but I like it. The Book Riot Quarterly Box continues to be a fountain of joy for book lovers. If I had to choose, I probably liked the last box I received better. Mostly because I loved the Banned Books coffee mug in that box. But this box has even more items in it than the last one, so I certainly can't complain. Part of the reason I was less impressed with the box this time was because it was literally sharing a table with the 60 books I brought home for BEA. I'm a bit overwhelmed with book goodness right now. From an objective standpoint, the Quarterly Box is fabulous and I highly recommend that everyone subscribe to it! 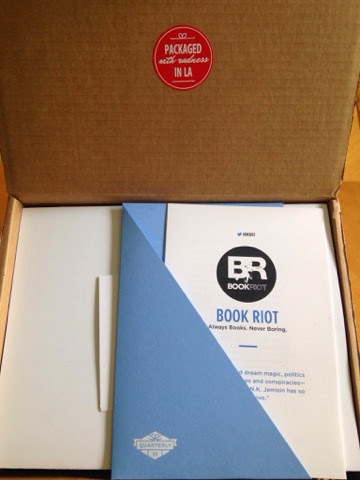 Check out my earlier post if you want to see my first Book Riot Quarterly Box unveiling! LOL! Love the tote. You really did need yet another one. I'm actually reading that same Sarah Maclean book right now as my getaway read and I'm thoroughly enjoy it. Cute tote bag. What a lovely idea and cool way to do things. $50 bucks though can get me 5 books I definitely want versus a mystery box of books you might not want so I can see the pros and the cons of that - unless you can pick a genre and they only send you books from that genre. I can't believe I didn't run into you at BEA - I'm so sad I didn't! That is so crazy that you have a lot of the items that came in the box!! I still want to get this box!! I would love it so much. You got a lottery item too.. how neat! Unfortunately, shipping to the UK on these boxes makes them far too expensive to subscribe to. Also, the best thing for in it is the tote, so I'd be pretty bummed if I got it. I've also preferred the previous boxes. I don't think I can subscribe to these boxes, but I still enjoyed looking at all the nice surprises you got!